This is my second VeganMoFo post for 2014. For more information on this month’s theme, see my Cook from Books description here. So when Michael published a cookbook under the same name of his blog, I quickly snatched up a copy and was thrilled that it reflected and embraced the same qualities that makes his blog so great: it celebrates cuisines from around the world, is written with a command of his subject matter without losing his trademark approachability and infuses a sense of playfulness and joy into each and every recipe throughout the pages of the cookbook. I first made his Tea-Smoked Lychees back in 2012, and still love how artful and fun they were to shop for, make and eat. 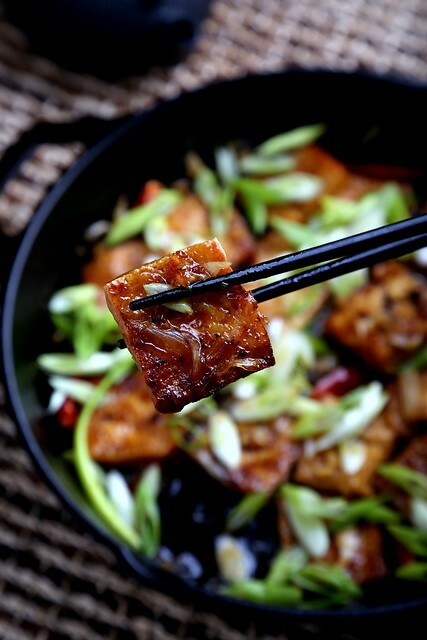 So on to what I’ve made here: Michael’s Caramel-Cooked Tofu, which will delight any tofu lover and turn any tofu-hater into a believer after one bite. 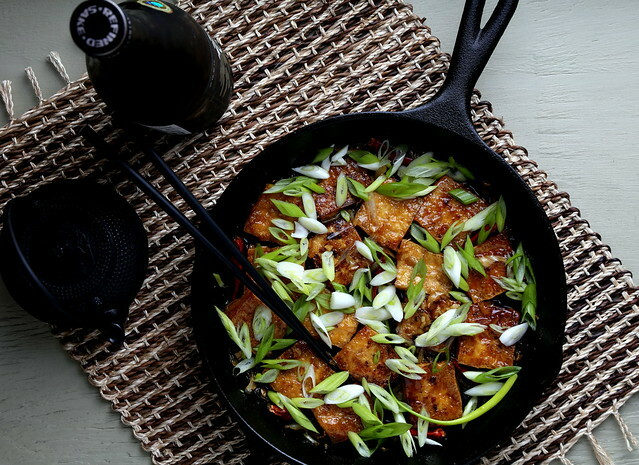 This tofu is seared well in a cast iron pan, then drenched in a thick sauce that’s mostly sweet, a little dark and highly aromatic. Once it’s ready, you’ll need to wait for it to cool off considerably because the sauce is really thick and holds in the heat (I burned my tongue on the first bite, but it was kind of worth it). I loved swirling the tofu around in the sauce before taking a bite, which is slightly crispy on the outside and warm and soft on the inside, kind of like French Toast. (Just look at those crispy edges to your right!) Jeff and I loved every bite of this dish, which is just one of 150 recipes that Herbivoracious has to offer. Next up to make: Soba Noodles in Shiitake-Shoyu Broth with Spring Vegetables, Kimchi Jigae with Shiiake and Daikon, Potatoes and Chantrelles in Red Wine, Mango Puffs with Lemongrass-Coconut Pudding and Black Sesame, Apple-Celery Sorbet and Vegetarian Nuoc Cham. Yum! I have to add to my new vegan cookbook collection! Wow, that sounds like a delicious way to make tofu. I love your photography skills btw, I am still working on mine. 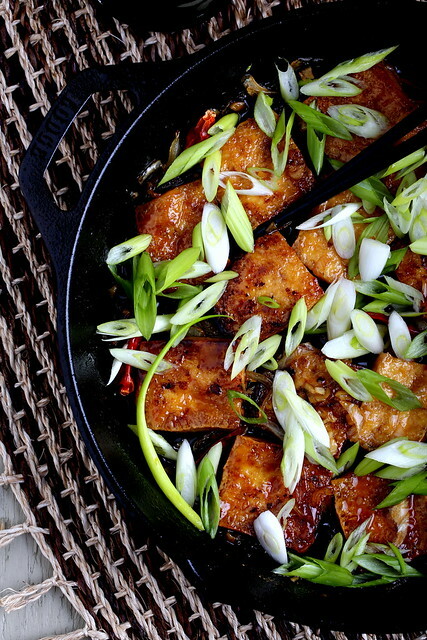 the golden color on that tofu looks great! perfection in bite sized squares! Where is the recipe, I cant wait to try it but I can't find it here. Out of respect for the author's hard work, I'm not posting the actual recipe, but perhaps this description/photo will inspire you to try out the book yourself! I've been eyeing that recipe for a while! Now I have to make it. You are two for two for making things I want to cook! Well, I can see it's time to get out my copy of Michael's beautiful book and head into the kitchen. Thanks for the push! That. Looks. So. Good. It totally sounds amazing! Happy VeganMoFo! !